"What Does it Take to Quickly Reach and Exceed a Million Dollars a Year in Promotional Products Sales?" Find out in Top Secrets of Multi-Million Dollar Producers, Vol. 2! How to Make Your Time Worth a High Multiple of What it’s Worth Now. What Do You Currently Have in Common With Multi-Million Dollar Producers? Right now, you possess a single resource in equal abundance with every top producer on the planet. So what do you have in common — even with those who earn $1,000,000 or more a year in personal income? You have exactly the same number of hours in any given day. So if you want to earn more in less time, you need to begin to value and manage your time the same way as multi-million dollar producers. How do you make your time worth $1 Million a year, instead of $50,000, $100,000 or $250,000? How much time do you spend with existing clients vs. looking for new clients? What’s a typical day like when you’re generating millions of dollars in sales? What’s an ideal day like? And how does it compare to a regular day? Our panel will tell you the answers in Top Secrets of Multi-Million Dollar Producers, Vol. 2. In this clip: Top Producer Patrick Doyle explains the importance of having the discipline to know your numbers and schedule your activities accordingly. Obviously, when you’re doing $1 Million or more in annual sales, you have to be generating leads and doing some serious prospecting. What are your primary methods of lead generation and prospecting? What are your most effective lead generation methods? What self-promotions have worked the best for you? What types of clients do you target? Our panel will give you the answers in Top Secrets of Multi-Million Dollar Producers, Vol. 2. In this clip: Multi-Million Dollar Producer Carolyn Moore discusses what it takes to get to a million dollars or more in annual sales. What you say about yourself and your company will give prospects and clients their first clue about the value you provide. That’s why the way you position yourself is so important. What’s the primary message you’re trying to communicate to prospects and clients about yourself and your business? How does this differ from when you were starting out? What’s the perception of you and your business in your market? How aware are your competitors of you? Our panel will tell you what they’re doing in Top Secrets of Multi-Million Dollar Producers, Vol. 2. In this clip: Multi-Million Dollar Producer John Vo explains how he handlies communication with clients and how he positions himself when dealing with commodity buyers. When you finally get to the point where you realize you can no longer do it all by yourself, what should you continue to do yourself and what should you delegate or outsource? What’s a typical day like when you’re doing millions of dollars in sales? What are the most important activities you feel you have to do yourself? What are the most important activities to delegate? When is the best time to start delegating? When did you start adding assitants or other employees? Our panel will reveal their insights in Top Secrets of Multi-Million Dollar Producers, Vol. 2. Multi-Million Dollar Producers can build their books of business quite differently. In this session on the numbers, you’ll hear some similarities and quite a few differences in the way our panel members do things. How many clients do you need to generate a million dollars or more in sales? How often do clients buy from you per year (frequency of purchase)? What is your average gross profit margin? How much of your focus is essentially on the four ways to grow: increasing the number of clients, increasing the average order size, frequency of purchase, and the gross profit margin? If I want to generate $1 Million or more in annual sales, what do I have to do to make that happen? What’s the difference between an average producer and a multi-million dollar producer? What are your primary methods of communicating with your clients? How often are you in touch with clients who don’t have an order in-house? What reasons and excuses do you use to contact them? Do you send salesletters, thank you cards, notes, gifts? If so, how do you process that? Our panel will let you know in Top Secrets of Multi-Million Dollar Producers, Vol. 2. In this clip: Multi-Million Dollar Producer Doug Dobbe discusses being perceived as expensive and creative, and the importance of being consistent. In a situation where you have to replace a key supplier, how do you make that happen? How do you know when it’s time to dump a key supplier? How do you handle the sheer bulk of supplier solicitations that are sent to you? How do you decide what to keep or even to look at? How can a new supplier get through to you? If they have something unique or unusual, do they even have a chance? Do you get and use case studies from suppliers? Our panel speaks out on these issues in Top Secrets of Multi-Million Dollar Producers, Vol. 2. Looking for that one magical product that sells itself? Then you’ll be interested in what our multi-million dollar panel has to say on the topic. What are the product categories you sell the most of? What products really make you a lot of money? What are some items that sell themselves? Are there any products you can show people that make them say, "Wow, I want that!" Our panel will tell you in Top Secrets of Multi-Million Dollar Producers, Vol. 2. What are examples of some programs you have sold and implemented for clients? What programs have sold best for you? Do you target the industry and then come up with programs for them, or do you target them first and then go back with a custom program? Members of our panel will weigh in on these questions and more in Top Secrets of Multi-Million Dollar Producers, Vol. 2. Even if you work for someone else, when you become a multi-million dollar producer, there will likely come a time when you will need help. In this Module, our panel provides insights on getting the help you need. If you could go back to the beginning and start over, what would you do differently when it comes to getting help? At what point did you know you needed to hire additional help? What’s the trigger? Do you hire independent contractors (1099) or employees? What commission do you pay your salespeople? Do you work from a home, office or storefront? Our panel will give you their insights in Top Secrets of Multi-Million Dollar Producers, Vol. 2. What software systems do you use to run your business? Our panel will tell you what they use and like in Top Secrets of Multi-Million Dollar Producers, Vol. 2. ...from Whoopla in Encino California. As a promotional products distributor, John is anything but typical. He started taking the promotional products business seriously in 2003, became a Top Secrets client in 2005 and first hit a million dollars a year in sales just two years later in 2007. … and he does all that business, with about 20 clients. ...from Brand IQ, Inc. in Houston, TX is a long-time multi-million dollar producer. It took Carolyn roughly 4 or 5 years to first hit a million dollars in annual sales. A few years later she broke the $2 million mark, and subsequently got to the point where she was personally generating $4.2 million dollars in annual sales, with just a couple of sales assistants helping her out. ...from Corporate Values in Roslyn Heights, NY. It took Woody about 4 years to break through the magical million dollar a year mark and he currently does $1.85 million in annual sales of promotional products. ...from Proforma Synergy got started with Top Secrets in 2002 and after applying the material he quickly doubled his sales from $400,000 to $800,000 a year. As he began to close in on the million dollar mark, a shift in his priorities created a shift in his approach, allowing Patrick to earn more money in less time, grow his sales and profits with less stress, and enjoy more quality time taking his daughters to hockey practice and dance recitals. ...from Matchsticks Promotions in San Diego, CA just two years to hit a million dollars in annual sales. Since then she’s done as much as 2 to 3 million dollars a year in personal sales volume and is recognized as an expert resource in her niche. ...from Ad Specialties & More, Ltd. in Norman, OK.
Barb was a member of the original Top Secrets of Multimillion Dollar Producers panel and is still going strong with double digit sales increases and average gross profit margins that beat the industry average by about 7%. ...from Strategies Ltd in Appleton, WI. Doug was also a member of the original Top Secrets of Multimillion Dollar Producers panel. He started Strategies in March 1991 and his company hit a million dollars in sales in his third year. He currently does in the neighborhood of $3.5 to 4 million dollars a year. Since appearing in the original Top Secrets of Multimillion Dollar Producers program, Bruce Jolesch from Dallas Texas sold his company, The Jolesch Group to the 6th largest advertising and public relations company in the world. He continued to operate the company for them during a three year transition period and after cashing out, he left his old company and joined Pony Express Printing/PXP Promotions in Garland Texas. Want to know what these exceptional producers can teach you about how to quickly reach and exceed a million dollars a year in promotional products sales? Then join us for Top Secrets of Multimillion Dollar Producers, Volume 2. My goal is to reach 1 million in sales in 3 years and I believe this program is exactly what I needed to get on track to do just that! Thank you David Blaise! Print out this comprehensive training guide and journal to access streamlined, easy-to-follow, bullet-points that outline all the major take-away points in the Top Secrets of Multi-Million Dollar Producers, Vol. 2 traning system. Read or skim through at your convenience. In addition, jot down all your important ideas, plans and notes right in here for easy access and retrieval of information. Order Now to Take Advantage of This Offer! As you’ll soon see, the price point and the package of extras and bonuses we’re offering makes this offer a total no-brainer for anyone who’s serious about getting this system. So if you want the BEST VALUE AVAILABLE ON THIS SYSTEM, now is the time, and this is the place. The true professionals in our industry, even the most experienced, are constantly learning… constantly hungry for more information. The fact that you have read this far tells me that you are very likely such a person. Yes! I want to start my full-year, risk-free trial of Top Secrets of Multi-Million Dollar Producers, Vol. 2. By ordering now, I understand that I will receive the complete system, along with any additional bonuses that may be added to this offer later. I understand that I can order today and implement the strategies risk-free in my business for one full year. 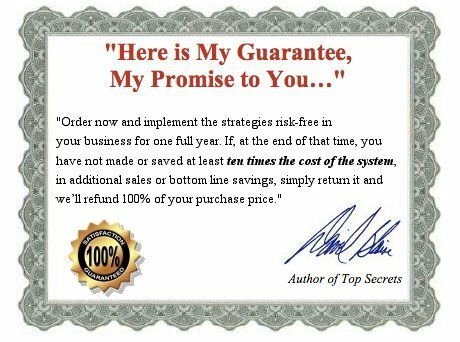 If, at the end of that time, I have not made or saved at least ten times the cost of the system, in additional sales or bottom line savings, as a direct result of the recommendations made in the system, I can return it for a full refund of my purchase price. If you’ve been exposed to our emails, podcasts, videos or live training, you have some idea of what Top Secrets of Multi-Million Dollar Producers Vol. 2 can do for you. Why not put the power of this proven Success System to work for you right now? PS This offer and bonus structure is guaranteed for a limited time only and is subject to change. If you are considering whether or not this system is for you, I encourage you to remember our full year, iron-clad, money-back guarantee. 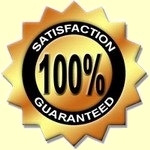 You cannot be unsatisfied with your purchase. Click above to get started.